Thousands of Las Vegans and millions of Americans move to new cities and into new homes and apartments every year. This leaves a lot of opportunity for scam artists to make some quick cash from unsuspecting people. Some people call themselvers “movers” with just a truck, a phone number, and a way to be found on the internet. And lots of so-called moving companies do just that. The problem is, they’re not out there for the long-term and often they’ll do anything to make a quick buck. These movers are scammers and they can make your move a really miserable experience unless you take some precautions and do a little homework up front before you choose your mover. The company has an actual physical address in your area. Never work with a mover who works from his home. The mover is licensed – movers are regulated by State Departments of Transportation and have a DOT # (for an example, see our license numbers in our website footer), and they must also be bonded and insured to get the DOT license. The mover has a good Better Business Bureau rating and a variety of online reviews from past clients showing they have a local history of successful services. It’s worth it to drive by the company’s physical location to take notice of the trucks used by the company. If rental trucks or unmarked trucks are the entirety of their fleet, it just might be a scam. A legitimate mover will invest in his brand name and equipment for the long term, and will want to proudly display his name on moving trucks all over town. If an estimate seems absurdly low, that’s probably because the mover is trying to tempt you into closing the deal and quickly parting with your cash. Try to get at least 3 moving quotes so you can weed out anyone that seems to be oddly out of step with normal pricing. Often, a low-price mover will come back later and raise the price significantly with “special” charges they happened to forget to tell you about up front. A legitimate mover will always give you a comprehensive moving quote in writing. If anything is missing from your written quote, ask them to go back and put it in writing. Ask your mover about their conflict resolution process, just in case anything does go wrong and to see if they truly operate with integrity. Similarly, if your prospective mover does not schedule an on-site inspection of your belongings, they may be scamming you. A fair and accurate moving quote is only possible with an actual inspection of what needs to be moved. If the moving company asks you for a cash deposit before the move, be wary. Never give up cash before a service is provided since no legitimate business works this way. Scammers can simply take your hard-earned cash and disappear. Understand the payment terms and get them in writing. Legitimate moving companies include some minimal level of coverage for your belongings free of charge to you. Make sure you read and understand the coverage. If they insist that you have to buy expensive coverage, that is a warning flag and you should select a different mover. Be sure to check with your own insurance carrier to see what they may cover already under your renter’s or homeowner’s coverage, and if you’re not sure about the mover’s coverage, ask your own insurance agent for help. You can download more useful information on how to evaluate movers and protect yourself from moving scams. Being knowledgeable about what to look for will help you make a better choice when you select your moving company. 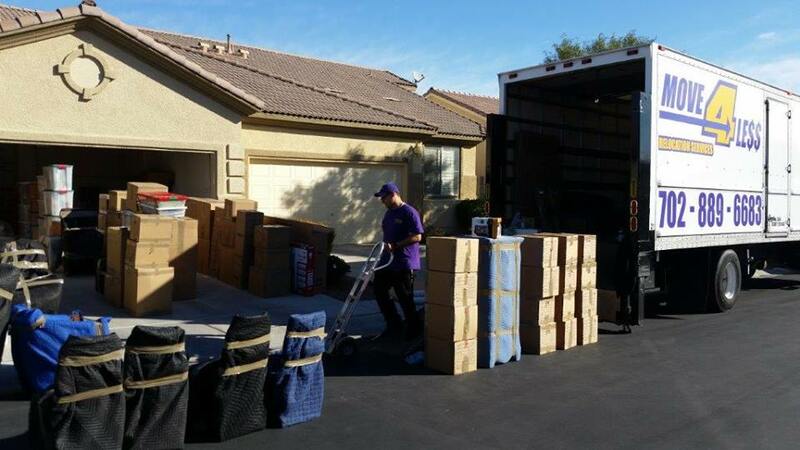 Move 4 Less is a well-established and trusted local Las Vegas mover. We pride ourselves on our attention to customer service, our thorough and fair moving quote process, and the great job done by our trained and experienced movers. Check us out and then give us a call for an affordable and worry-free move.